The ISC-PIF is a CNRS unit that has the particularity to explicitly develop an inter-institutional research on complex systems through core services. The concept of “service” goes beyond the technical and scientific resources: it is the ability of the Institute to develop a framework-workplace, resources, skills, governance- to support the emergence of collaborations oriented towards the pooling of resources and scientific synergies and to implement innovative projects. The partnership agreement signed between CNRS and each of the ISC-PIF partners embodies the collaborative nature of the process by establishing a partnership system for the governance of UPS, consisting of a Council of Partners (representing all partner organisations) and a Steering Committee (12-18 members) which assists the director in the implementation of the guidelines of the institute. The financial contribution of the ISC-PIF partners in the framework of these agreement constitutes the basis for the sustainability of ISC-PIF and makes it possible to offer a wide range of free services to the scholars affiliated to these organizations. 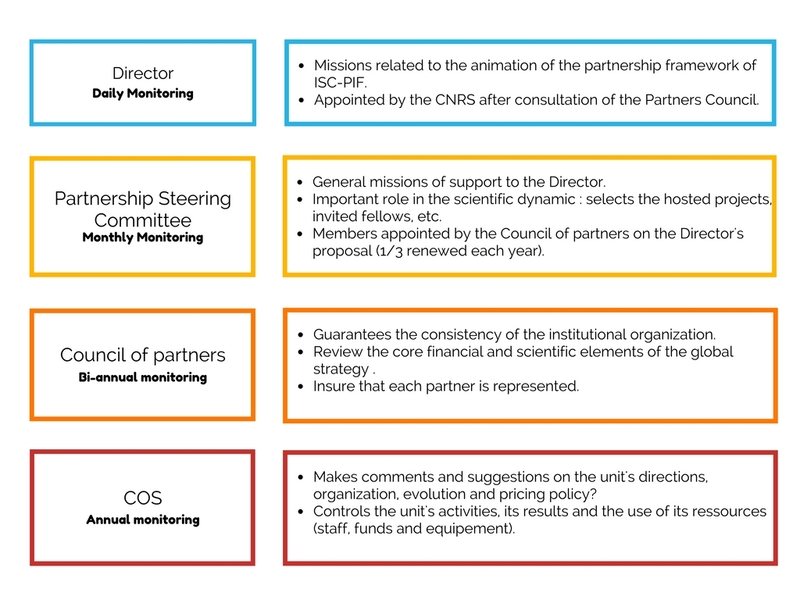 The ISC-PIF, like all CNRS units has a statutory body set up by the CNRS: the Orientation and Monitoring Committee (COS).